I made another game! It feels so good to have made another game and gotten back into the spirit of gamedev. For the 2 Colors Game Jam, I made a game called SP34R of Hope, which is a top-down arcade infinite runner where the player runs into things instead of dodging them. The game jam's themes were "Space", "You are the weapon", and "2 Colors". This provided some really excellent limitation on what I could make, and made it easier for me to decide what to do. Originally, I wasn't going to participate in the game jam because I'm juggling a lot of priorities right now at both home and at work, but once the themes were revealed, my brain started poking at various game ideas and I fell in love with the story of SP34R of Hope. I love this tail because it feels so epic and yet also so small, about one person's chance to save as many people as possible, at the sacrifice of them self. Doing everything through a red screen glow of a computer made it feel true to being that person, and also gave me the excuse to only use two colors. It also gave it a perfect arcade-like feel. Don't plan on joining the game jam until its already started. Make sure you're at work for most of the first day of the jam. Make sure for the second day of the jam, you have a family party to go to (with family you haven't seen in forever, so you really want to go!). And make sure your family lives an hour and a half away, so you have lots of driving time that day. Also make sure you've been partially sleep deprived all week leading up to the jam, so during the jam, you're borderline delirious. I'm not even kidding about these points, though obviously, I don't actually recommend doing them. The severe limitations they placed on what I could make in the short time that I had, actually helped me focus on what I could make, and prevented me from over extending myself into non-core gameplay stuff. They kept me focused on one good and fun verb, and just add juice and polish to that action. I focused heavily on nailing the themes, which paid for itself. Getting 1st for Theme and 9th for 2 Colors made up for the other average scores. Forcing me to actually limit the scope I could make, kept me from running off and trying to make an upgrade system or something else before the core verb could be polished. The 2 Colors limitation was amazing for helping me make super fast pixel art. I'll definitely be limiting my palette in the future because it just makes it more fun to make art. Having lots of non-development time (at work, at family party, driving) gave me time to think about EVERYTHING and make a simple plan. The distance from the game made it easier to keep perspective on what I was trying to make. Adding more variation to everything. More asteroid types, maybe make them break apart into chunks. 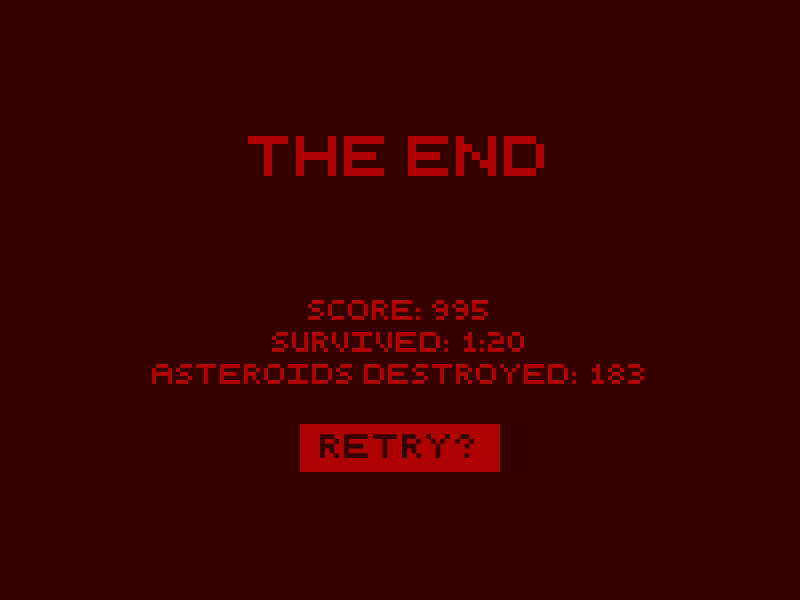 Adding powerups would have made harder choices on hitting an asteroid vs a powerup. Plan in elements that change up the core verb so that there's lots of variation that happens during the game. 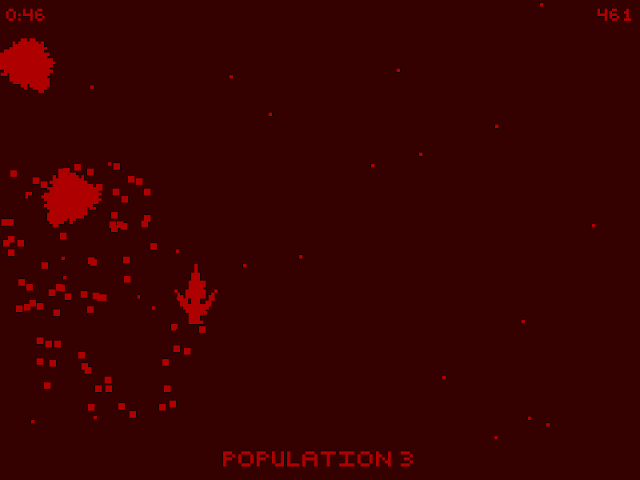 Transitions would have helped the mood a lot, to emphasize when the population is destroyed and the game ends. Need to add audio/visual cues to when people die, and population is running out. This would have upped the tension of the gameplay. Transitions between scenes would have helped A LOT, not just for art of the whole piece, but also for the mood of the game. It would have also helped show that the player is viewing everything through a computer screen. I need to add more details to my pixel art without relying on shading and color. 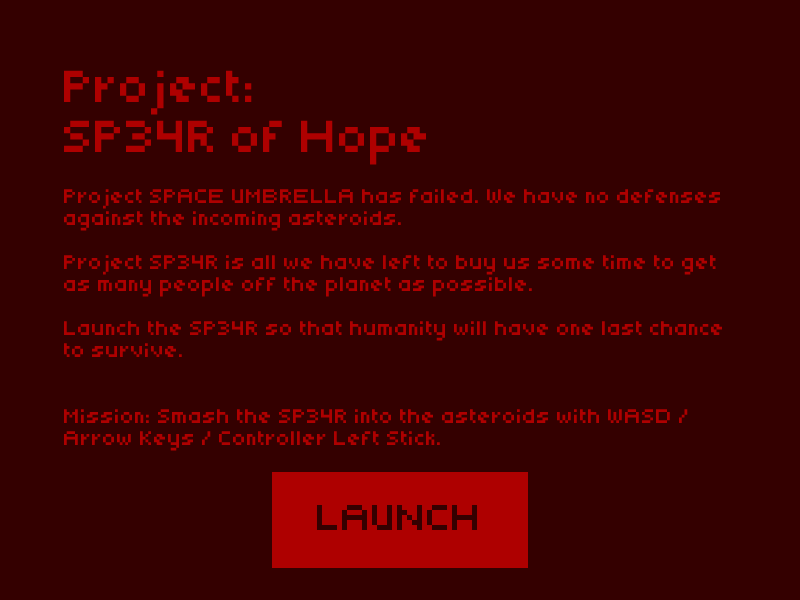 I'd like to keep working on SP34R of Hope, because I built it in a way to possibly make it playable on Android devices. However, now that I've been trying it out on my phone, there's a lot of challenges that I face to make it as fun as the web/computer version. Touch/dragging the SP34R makes the game far too easy because there's no movement speed limitations. The game was built for the player to eventually miss many asteroids and to finish when the population is all gone. If the player is able to hit every asteroid, this breaks down real quick. I don't want to do on screen buttons/controls because I personally don't like the feel of trying to touch a non-button on the screen. Touching anywhere feels better and is more intuitive. It feels best to play in portrait orientation, but this makes the game even easier because the player has more time to react to the asteroids, and not a lot width to cover. The game is fun for a few rounds, but becomes boring after that. There needs to be more long term goals to keep interest in playing the game.